Where the Wild Things Are, the title that the artist chose for her exhibition, is borrowed from Maurice Sendak’s renowned children’s book, which blends a childish fantasy with violence and horror – just like the Afghan war rugs that serve as the point of departure for the video installation exhibited here. The Afghan war rugs, a fascinating and unique phenomenon, are a combination of traditional rug weaving technique with a history paved with conflicts and foreign military presence. The Soviet invasion of Afghanistan in the late-1970s and a decade of occupation, civil wars and American military intervention have yielded a plethora of war rugs. Some of the Afghan war rugs are narrative in nature, and feature figurative portrayals of modern weapons, portraits of warriors, war and terrorism casualties, geographical maps alongside various inscriptions that attest to the military and political upheavals. The war rugs, the anti-war rugs and victory rugs, both spectacular and horrifying, have become sought after collector’s items in the West, the subject of research and numerous exhibitions. What started as an authentic expression of the changing reality and landscape, a means for transmitting to the world the horrors of war and occupation, migration and uprooting, an expression of resistance and a means of survival, had been commodified and turned into touristic memorabilia industry. The weaving was performed predominantly by women and the trade by men. They were weaved in the rural areas of Afghanistan, but also in the refugee camps in Pakistan and Iran, and thus absorbed stylistic influences from different traditions. Many rugs maintain the symmetrical ornamental composition of the traditional Afghan rugs while the decorative patterns were replaced by images of war. Geometrical patterns of rich and stylized flora and fauna were converted into convoys of tanks, helicopters formations, landmines, hand grenades and missiles, which were transformed into a tapestry of decorative patterns. 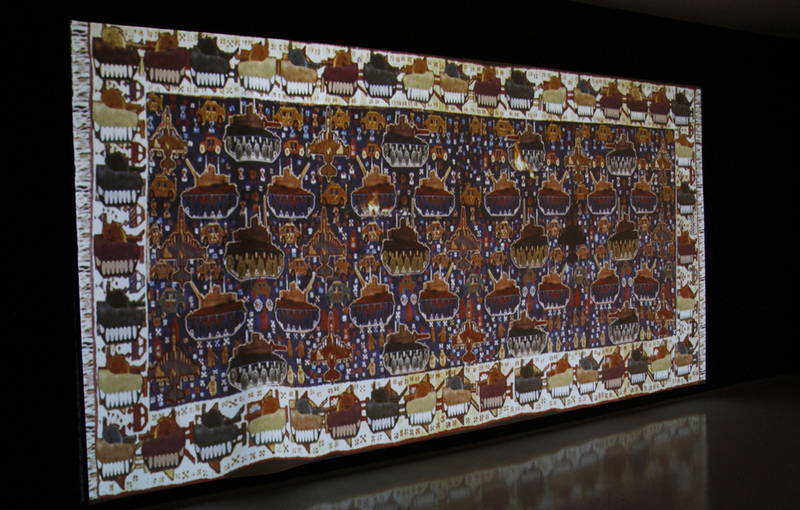 Rugs of this type served as the point of departure and basis for Nevet Yitzhak’s video installation exhibited here. In this work, the stylized images of Soviet firearms were replaced by three-dimensional models of weapons commonly used by other armies and warzones, and their animation, created by various software, re-instills in them the violent, destructive potential. The labor-intensive craftsmanship of weaving the rugs has been transformed into a no less laborious digital work, and the materiality of the rugs was replaced with a projection of light. At times it seems that spreading the digital rugs by projecting them along the walls of the gallery brings them back into the domestic intimate space for which they were designed. The illusion is interrupted when the three-dimensional models (taken from computer games and combat simulations) which the artist integrated into the rugs, erupt and realize the qualities of the programs that rendered them when they embark on a carpet war accompanied by sounds of explosions and gunshots, also taken from computer games, wreaking havoc on the non-material material of the rug (the Second World War term “carpet bombing” comes to mind here). Like other artists before her, Nevet Yitzhak makes use of the seductive nature of animation, as well as the aesthetics of computer games in order to express weighty subject matters in her works. 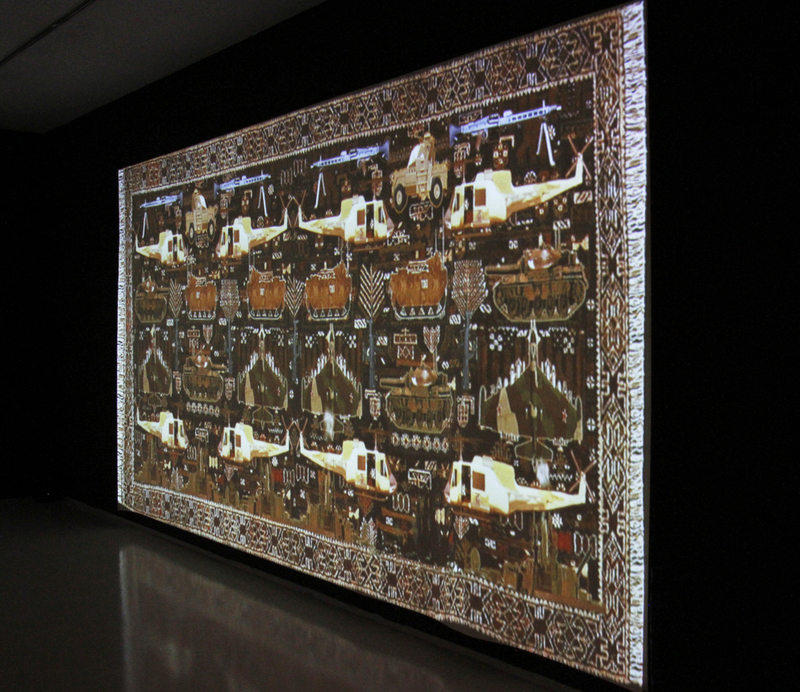 The manner in which the images of war were assimilated in the tapestry of the rugs and their animation, erasing the original images as a result, are akin to processes of assimilation and integration of culture that entail violence and oppression on the one hand and a struggle to preserve cultural difference and singularity on the other hand. The interest in the construction of cultural identity and gender stereotypes in a postcolonial and post-feminist society, originate in the examination and criticism of the Israeli state of affairs. The relation between a Western or Westernized culture to an Eastern culture, concepts like conservatism and progress, cultural hegemony and ethnic traditions, high and low, art and craft, localism and globalism, appear in Nevet Yitzhak’s work not as contrasting dualities, but as notions that are interweaved with one another. [*] For instance, in Video Concert, 2005, a multichannel video installation, a rhythmic orchestration of images and war sounds, archive footage of Israel’s wars, with music and images taken from classic Egyptian musicals, and in oriental rugs animation works in several video installations. © All rights reserved to Noga Gallery of Contemporary Art. Site built by Sasha Tamarin.